Location: Church of Saint-Germain-des-Prés, Paris. 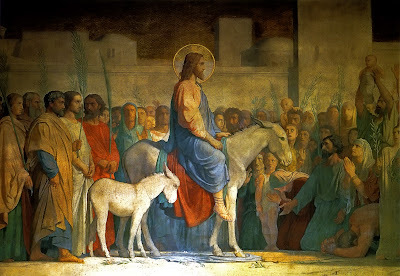 Matthew 21:1-9 As they approached Jerusalem and came to Bethphage on the Mount of Olives, Jesus sent two disciples, saying to them, “Go to the village ahead of you, and at once you will find a donkey tied there, with her colt by her. Untie them and bring them to me. If anyone says anything to you, say that the Lord needs them, and he will send them right away.” This took place to fulfill what was spoken through the prophet: “Say to Daughter Zion, ‘See, your king comes to you, gentle and riding on a donkey, and on a colt, the foal of a donkey.’” The disciples went and did as Jesus had instructed them. They brought the donkey and the colt and placed their cloaks on them for Jesus to sit on. A very large crowd spread their cloaks on the road, while others cut branches from the trees and spread them on the road. The crowds that went ahead of him and those that followed shouted, “Hosanna to the Son of David! Blessed is he who comes in the name of the Lord! Hosanna in the highest heaven!”. The wall panels throughout the nave and choir of Saint-Germain-des-Prés are work of Jean-Hippolyte Flandrin, from 1842-1849. It is apparent from contemporary criticism that Flandrin's mural scheme attracted much attention for its abstracted forms, and flattened frieze like compositions running the length of the choir. Christ's Entry into Jerusalem, in the Sanctuary on the left of the high altar, is a fine example in this outstanding series of frescos. Christ, majestic though he rides a humble donkey, is surrounded by an adoring throng. Men and women bow down before him, the excitement so great that to the right a man even lifts a child to glimpse “the Son of David.” The compression of depth that Flandrin achieved creates an even further sense of being part of a packed throng. Jean-Hippolyte Flandrin (March 1809 – March 1864) was a 19th-century French painter. He was the second of three sons, all of whom were painters in some aspect. Hippolyte and Paul, his younger brother, spent some time at Lyon, saving to leave for Paris in 1829 and study under Louis Hersent. Eventually, they settled in the studio of Jean Auguste Dominique Ingres, who became not only their instructor but their friend for life. At first, Hippolyte reportedly struggled as a poor artist. However, in 1832, he won the Prix de Rome for his painting Recognition of Theseus by his Father. This prestigious art scholarship meant that he was no longer limited by his poverty. Though Flandrin painted a great number of portraits, he is much more known today for his monumental decorative paintings, such as those at St Germain des Prés in Paris.